I refuse to think about the heel yet, but I’ve already learned a lot. I comprehend Second Sock Syndrome: I’m certain the thrill of making these will carry me through to the end, er, top, but I already understand that after making one by itself the second would be less a thrill, more a matter of grim determination. I’m testing a theory about the causes of the pain that some bloggers report when knitting socks. I have found that the wool can hurt my fingers, and I do get arm pain sometimes. The two usually occur together, and I think it’s a function of tension/stress AND the need to see what this fine-ish yarn is actually doing on these thin needles. When things started to hurt I analysed what I was doing, how I was holding the work (three cheers for Pilates and previous wrist/elbow problems that have taught me that these things matter), and found that I’m holding the knitting far more tightly than I need to — the wool on the needles is biting into my fingers because of the ferocity with which I’m pressing down on it — and I’m holding the knitting close to my face, high up my chest so my middle-aged eyes can see what I’m doing. By looking OVER the top of my reading glasses to see it, which is too stupid for words. To hold the knitting up I’m bending my arms, compressing my elbows and wrists, which is painful if I do it for long periods especially when I’m tense. The solution I’ve found is to consciously stop stressing and hold the work more naturally. Work in better light – I’m looking for a lamp to stand by my comfy chair – and, if you wear reading glasses, make certain you’re using them correctly. My VDU glasses (reading lenses set up for the distance I should be sitting from the computer monitor, essential for someone who spends hours every day in front of one) were a significant improvement because the ‘Reading’ bit of my bifocals is set up for a closer distance than is comfortable for holding knitting. For some people it might be worth getting a really cheap pair of glasses made up for their comfortable knitting distance in the same way that weavers have glasses set up for weaving. This entry was posted in Uncategorized on May 30, 2006 by sarahw. I’m really (unjustifiably) perturbed that you’re knitting your socks ON TWO CIRCULAR NEEDLES at the same time. I’ve been meaning to do this for ages and still haven’t got round to it, thinking that maybe DPNs are better (oh yeah? That’s just an excuse, of course). 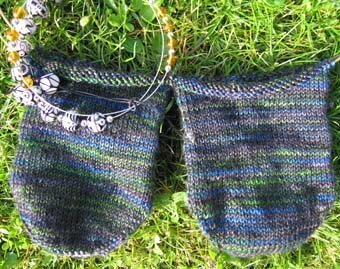 And you’ve never even knitted a sock before…… I’ve taken to knitting two socks at the same time on DPNs (separately), as I really have a problem knitting two items that are the same, one after the other. It works for me, so far.It’s so true that much of the time some of us are busy tensing our bodies in ways that are detrimental to our health. If I make myself specially aware, I will always notice tension where it is not required. For instance, as I’m typing now, I feel the muscles in my lower back are especially tense, and you’re so right – it’s something to be aware of. It can cause all manner of aches and pains.